You are here:Home » Product Reviews » IPL/Laser For Pigmentation At EHA Clinic + Giveaway! I've some mild pigmentation on both sides of my cheeks. They're not exactly an eye-sore but since my mom was at EHA Clinic for her Reverse The Effects Of Aging With Restylane Dermal Fillers, I might as well just get rid of those unsightly spots while waiting for her. Click on the link to watch a video on the procedure & to read more on Dr Tam's profile. After my consultation with Dr Tam, I was recommended to have a combination of Spectra Q-Switched Nd: YAG Laser & IPL to target both the superficial & deeper pigmentation as well as my open pores. Laser/IPL Treatments for freckle removal are the most advanced way to remove unwanted freckles. The laser & light wavelengths are attracted the melanin in the freckles, the light energy transforms into heat which effectively fragments the melanin particles which are then re-absorbed & naturally expelled by the body’s immune system. A series of treatments can drastically reduce unwanted freckles. The Spectra laser uses high intensity pulses of laser light to significantly lighten or remove pigments & tattoo particles of all colors without harming surrounding healthy cells. It can be used to resurface the skin to treat acne scars & wrinkles, remove minor vascular lesions, & remove seborrheic keratoses. Emla, a numbing cream was applied onto my cheeks for 20 mins after cleansing my face. Goggles had to be worn to protect the eyes during the laser treatment. No photos were taken due to the laser procedure. Each Laser & IPL treatments took about 10 mins each. The toning laser helps to tone the skin & reduce the deep pigmentation. IPL targets the superficial pigmentation & even-out the skin colour. A healing mask was applied after that to cool down & help the skin recover, followed by the EHA 24-hr Sun Shield. There is no down time for me; I can return to work after the treatment. Depending on what is done for a more serious case, there may be some scabbing or redness & a rest of two days may be recommended before applying cosmetics to cover them before going to work. Scabs dropped off. Intensity & amount of dark spots on one side of cheek almost gone, with the other side significantly reduced. Most patients would notice improvement after one session for superficial pigmentation like mine. For some, significant improvement is seen only after 3 to 6 sessions. Because my pigmentation is very mild, immediate improvement can be seen. Combined IPL & Laser: S$350 (usual $500). See my 2nd session @ What IPL/Lasers Can Do For You At EHA Clinic! Here's EHA latest innovation!! EHA’s Sun Shield 24hr has been proven to block both UV-A & UV-B rays by 99%, for a period of 24 hours, with just one application! A very thin application of this product (10-15 microns) is all you need to maintain its effect. Even when applied thickly to the skin, the base - which is equivalent to an SPH factor of 100 - still appears transparent – giving a natural look without the feeling of any make-up application. The skin will feel & look so natural that anyone can use the product. The product can also be used by men & children. This product is a water proof type; so a relative amount of sweat will not remove the product. The protecting ingredient also prevents spot generation, keeping the skin cool & resistant against sunburn. Sun Shield 24hr can also be used as foundation base before make-up application! Wanna win one of the 3 Travel Size Tubes worth S$38? Simply share to win! Make sure you complete all the steps. "Like" EHA Clinic & Skincare. 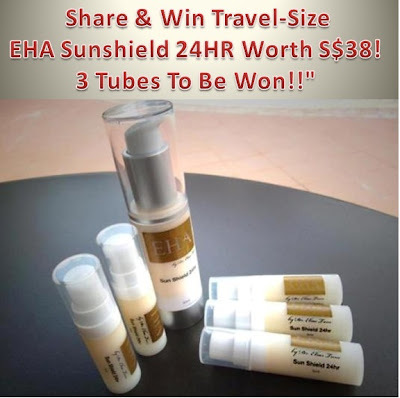 Copy & paste this msg on your FB wall: "Share & Win Travel-Size EHA Sun Shield 24HR Worth S$38! 3 Tubes To Be Won!!" Make sure it's set to Public so we can see the pix on your wall. Leave your Name, NRIC (first 2 digits eg. S80xxxxx), Facebook link & Email once you've "liked" & "shared" in the comment box below, so that we can verify your entry & enter your name to the draw. Do not sign in as "Anonymous"!! Instead, select "Name/URL" under Comment As & type in your Name. You can leave URL blank if you don't own a blog. Contest begins 4 Sep 2012 & ends at 9pm on 11 Sep 2012. Results will be announced over that weekend. Winners will have 48hrs to acknowledge their winnings in the comment box, or another winner will be selected. No email notification will be sent, so please look out for announcement here or in Facebook. Follow This Blog Via Email (right-hand side of the blog) & have the announcement delivered right into your mailbox! Winners For EHA Sun Shield 24hr! Missy Moo, welcome back! Thks for your entry! Rain, thks dear! Good luck again! Liz, thks so much for your lovely comments! Julia, all the best to your entry! Mr Lonely, thks & have a wonderful day! The results are visible instantly. You always look great! Ash, indeed! U're such a doll, sweetie! You look great! The difference is quite obvious. Juliana, thks for the kind note & good luck! Evelyn, as long as we wanna prevent pigmentation, it's always best to stay out of the sun :< Try to stay home for a week?? Wow! The difference can be seen immediately on your skin...and I have to say it again...you actually have good skin! missyblurkit, thks dear! You're always so sweet. Edmend, hahaha! U're so cute! I am totally impressed by the results of IPL laser treatments. Skin looks too beautiful after treatment. I must say it's a miracle treatment without a cut on skin. IPL, thks for visiting & have a good day! Quek, hope u'll get better luck this time! Sheryl, good to see u again! Wow, the result is so quick! gorgeouswyne, nice & super fast! Shanice, thks for your kind note! Good luck! Awesome the results is really great. It can seen right away. Bebs, thks & all the best! That's great information which you have mentioned in your post. Nice post. Thanks for covering every points about IPL/Laser treatment. It is very motivational post for those who want to go through this treatment. Keep it up. Thanks once again. Thks for visiting! Will check out your blog soon!